Deaconess Mary Katugwa was born on 23rd Nov, 1959 to late Elder Leslie & Mama Modupeolu Obielodan in Ode Omu, Kwara State. She is from Isanlu, Yaba East Local Government in Kogi State of Nigeria. She had her early education in the North Eastern part of Nigeria & graduated from the prestigious Ahmadu Bello University, Zaria (ABU) in 1983 with a Bsc in Zoology and her Masters in 1987 from the same university. 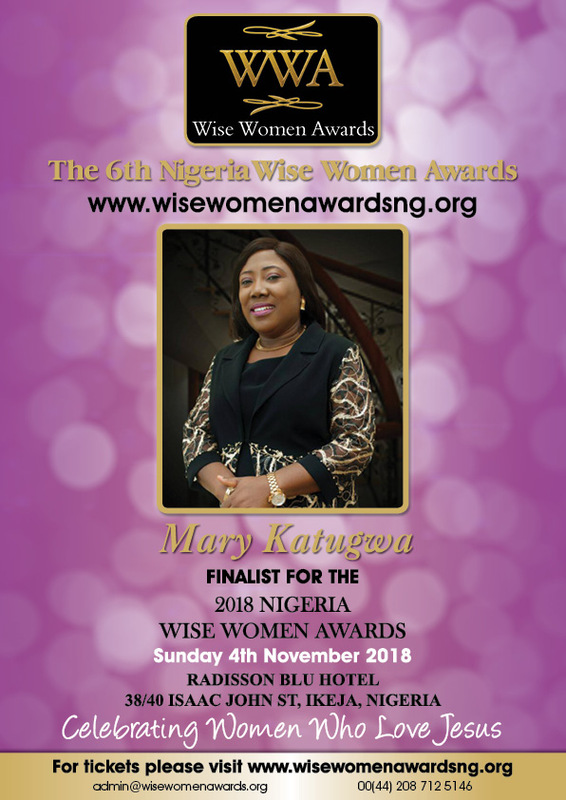 She started her career as a lecturer at ABU and took on other businesses on and off to give her ample time to look after her young children after which she joined the Federal Government Training Parastatal, the Industrial Training Fund in 2001 where by God’s grace she is a Deputy Director & the Area Manager of The Victoria Island Area Office. She is a child of God with great passion for Kingdom matters. Her work in ministry began in Ikoyi Baptist Church as a founding member of the teenager’s ministry. In 2002, she was ordained a deaconess in the church and today her work with young people transcends her Church to the wider society. It is a God given gift that she can listen to them & reach out to touch their lives by finding solutions to their problems. In church she was nicknamed “mama teenagers “. She organized camp meetings for them, got resource persons to come along & they always had fun studying the word with some social activities on camp. The ministry of reaching teenagers and youths is of great joy to her. Currently she and her family have over 10 youths living with them from different tribes & backgrounds but all loving Jesus. She has trained many that are in different parts of Nigeria and abroad, some married with their children calling her grandma even before she had her biological grandson. Some who came from a muslim background met with Jesus in her home and gave their lives to Him. They are serving God as leaders in their churches. Her life philosophy is A life lived without touching any life is a wasted life”. As long as God gives her life, she will continue to impact her generation for Christ! She is happily married to Chief James Atumye Mawo Katugwa with two wonderful children & a very sweet grandson!